Prime Minister Imran Khan on Saturday said he was disappointed at India’s arrogant and negative response to his call for resumption of peace dialogue between the two countries. 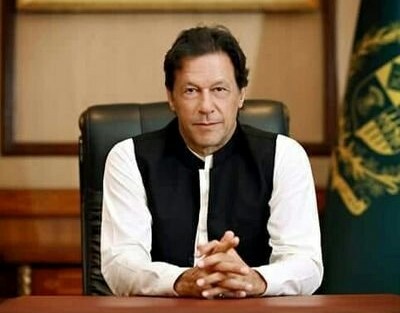 “Disappointed at the arrogant and negative response by India to my call for resumption of the peace dialogue,” PM Imran tweeted. "However, all my life I have come across small men occupying big offices who do not have the vision to see the larger picture," he added. On Thursday, the premier wrote a letter to his Indian counterpart Narendra Modi and called for a resumption of dialogue between the two countries. PM Imran had also called for a meeting between the foreign minister of the two countries on the sidelines of the 73rd United Nations General Assembly (UNGA) session. Hours after reports circulated regarding PM Imran's letter to Modi, Indian Ministry of External Affairs (MEA) spokesperson Raveesh Kumar confirmed that Shah Mehmood Qureshi and Sushma Swaraj would meet on the sidelines of the UNGA. Kumar, however, had not specified a date for the meeting but sources told Geo News that it was scheduled for September 27. However, on Friday, the Indian MEA spokesperson announced the cancellation of the meeting, citing the alleged killing of three Indian police officers and a personnel of the Border Security Force (BSF) in Indian-occupied Kashmir (IoK) as the reason. Earlier today, Foreign Minister Shah Mehmood Qureshi expressed disappointment at India's backtracking and said New Delhi called off the planned meeting owing to an issue which took place in July. “India in September presented an issue which took place in July as an excuse to back out of the meeting,” the foreign minister said while speaking to the media in Doha en route to New York. "I think this is not appropriate," he added. FM Qureshi elaborated, "Stamps were used as an excuse although the stamps in question were distributed before the PTI-led government took charge." The foreign minister said India first agreed to the meeting and then “later found an excuse” to cancel it. A statement released by the office of Pakistani government's spokesperson also said India's reasons provided for cancelling the meeting "are entirely unconvincing". The statement went on to mention that the postage stamps in question "were issued before the 25 July 2018 elections, as a result of which the Government of Prime Minister Imran Khan assumed office". "The stamps highlight the gross and systematic human rights violations in Indian Occupied Kashmir, which were extensively documented also in a comprehensive report issued by the United Nations High Commissioner for Human Rights as late as June 2018," it added.